Every teacher has heard the “my computer crashed last night and lost all my work” excuse right before a major deadline, and some students have even experienced this happening for real. Last week I covered some of the backup hardware and systems you can use to protect your work. Today I’ll cover some of the software and strategies you can use to backup your important files. What do you want to lose? Backup everything except that. You don’t need to backup your operating system or application folders, because you can restore them from their DVDs. Personal documents, work, and photos are obvious choices to backup. Less obvious ones include your browser’s bookmarks (I hate losing these). Digital downloads like music and software might also need backing up. Again, this depends on how much you want to lose. If you back up every week, at worst you can lose a week’s worth of work. But at IB, that is a lot of work! I use Carbonite to backup every day and a separate system to perform a weekly backup. How many backups should you make? Sometimes something might go wrong with your computer which is not immediately obvious (for example, virus infection). If you make frequent backups, you might overwrite a good backup with an infected backup, and then be stuck when you need it. Some people use generational backups: using one medium (e.g. hard disk) for one week’s backup (the father copy), then a separate hard disk the next week (the son copy), then back to the father disk the week after. This doubles the backup life, but obviously needs two hard disks. A backup is useless if you forget to copy your most important files. Manually copying files is error prone and slow, which means you probably won’t do it very often. Windows 7 has the built-in Backup and Restore feature, but personally I prefer to use AllwaySync (free) to synchronise the key folders on my hard disk with those on my external hard disks. 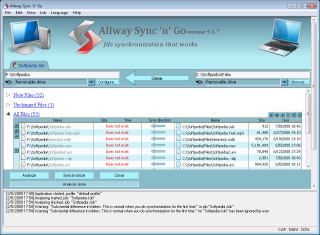 Once it is configured, clicking ‘Synchronise’ will copy only the files that have changed since the last backup. I do this each week (usually).Another good option for Windows users is Paragon Backup & Recovery 2010 Free Advanced Edition which is highly regarded and can also make images of disk partitions and backup to DVDs or over a network. It’s a very powerful tool – and quite surprising that it is free.Mac users have the built-in Time Machine software available to them. If for some reason this does not fit your needs, Carbon Copy Cloner and SuperDuper! appear to be two well regarded solutions, though I haven’t used them. Many people and organisations forget the need to secure their backup copies of data. An external hard disk lying around is a tempting target, and unlike a laptop, might not be missed for a while. I format my external hard disks with the freeware TrueCrypt, which automatically encrypts the data on them and requires a password to mount them. Once mounted, the encryption operates transparently and all software functions as normal. Another option is to make encrypted file containers, which are single large files that act as virtual hard drives.